Colorectal cancer (CRC) is among the most commonly diagnosed cancers worldwide. In 2012, according to the GLOBOCAN estimates , there were 1,360,602 new cases of CRC worldwide (3rd most common cancer worldwide, accounting for 9.7% of all cancers apart from non-melanoma skin cancers), and 447,136 new cases of CRC in Europe (2nd most common cancer in Europe, accounting for 13.0% of all cancers apart from non-melanoma skin cancers). In 2012, there were an estimated 693,933 deaths from CRC worldwide (8.5% of the total number of cancer deaths, 4th most common cause of cancer related deaths), and 214,866 deaths from CRC in Europe (12.2% of the total number of cancer deaths, 2nd most common cause of cancer related deaths). The 5-year prevalence of CRC (i.e., the number of CRC patients who were still alive five years after diagnosis) in 2012 was estimated at 3,543,582 worldwide (68.2 CRC survivors per 100,000 population) and 1,203,943 in Europe (192.3 CRC survivors per 100,000 population). 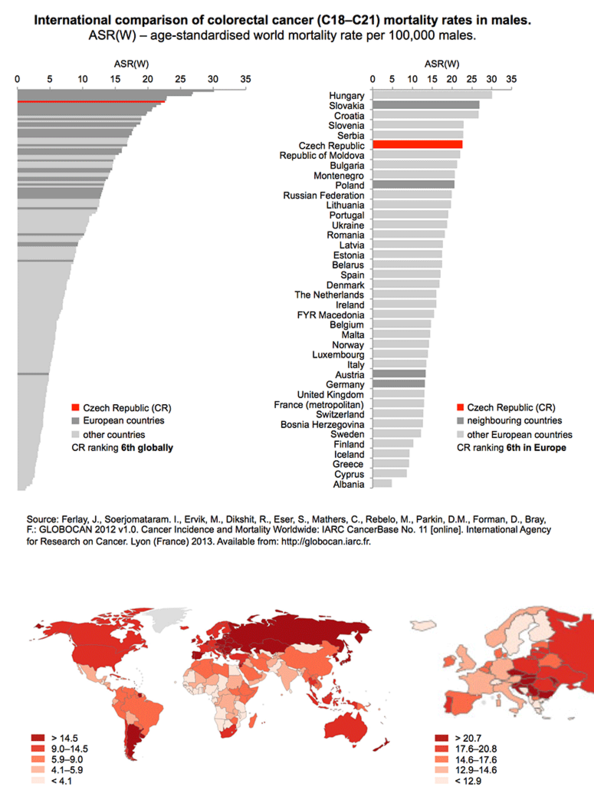 In 2012, the cumulative risk of CRC in persons aged under 75 was 1.95% worldwide (2.36% in men, 1.57% in women) and 3.51% in Europe (4.48% in men, 2.73% in women) . Table 1. 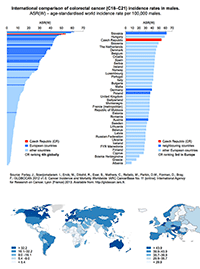 Epidemiology of colorectal cancer worldwide. Source: GLOBOCAN 2012 . Table 2. 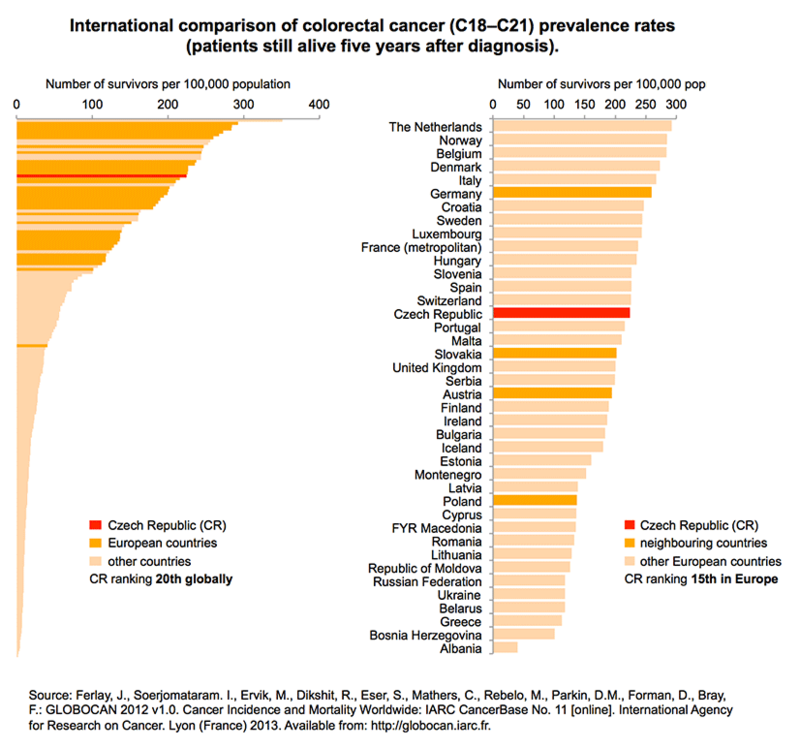 Epidemiology of colorectal cancer in Europe. Source: GLOBOCAN 2012 . Tables 1 and 2 provide a basic overview of epidemiological characteristics of colorectal cancer worldwide and in Europe. 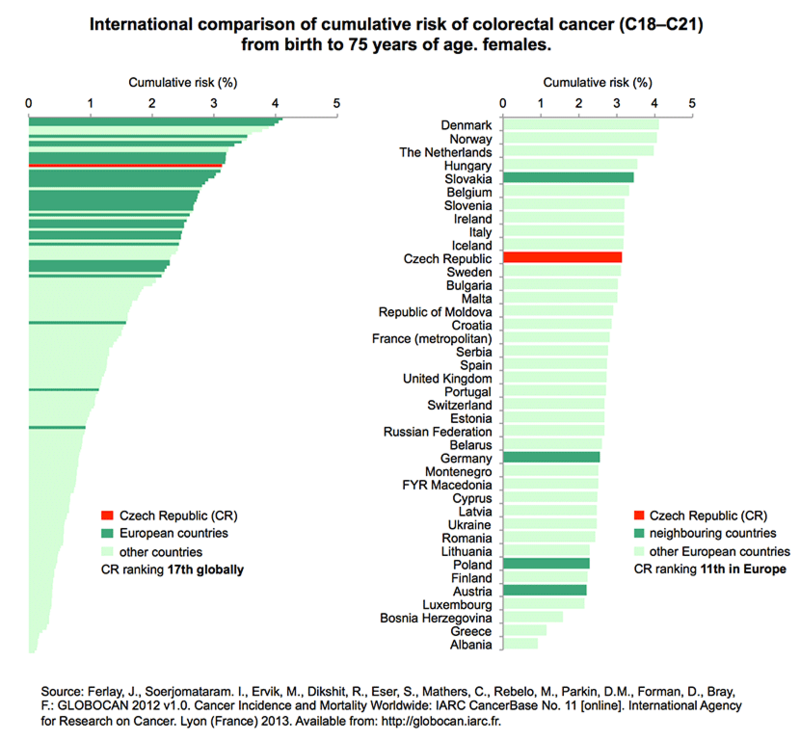 This data demonstrates a significant colorectal cancer burden in European countries, which is still associated with very high mortality rates. High colorectal cancer incidence and mortality rates are also shown in Figures 1 and 2. 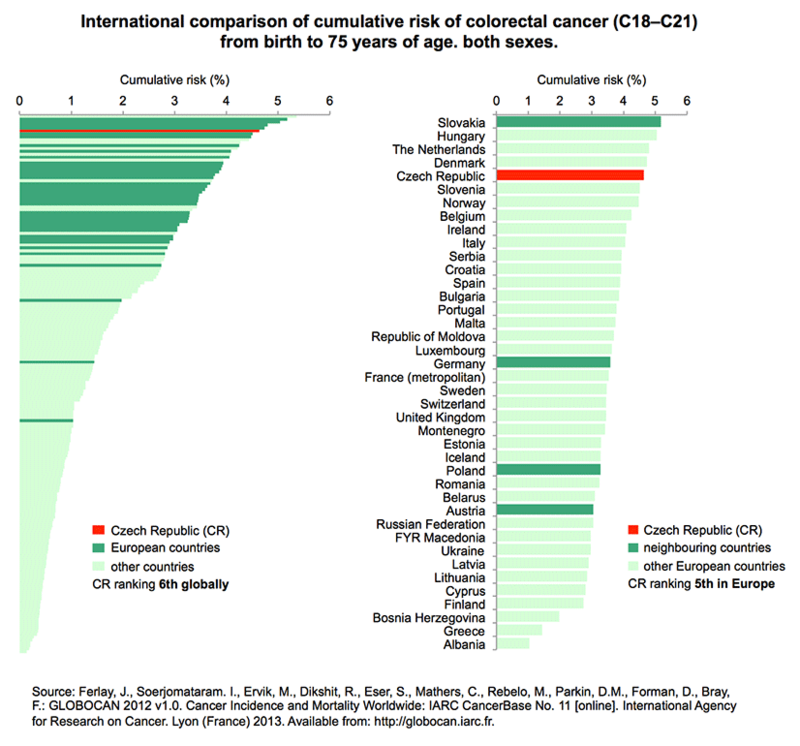 Moreover, recent statistics have indicated that the Czech Republic has one of the highest rates of colorectal cancer worldwide, and this applies particularly to Czech males. 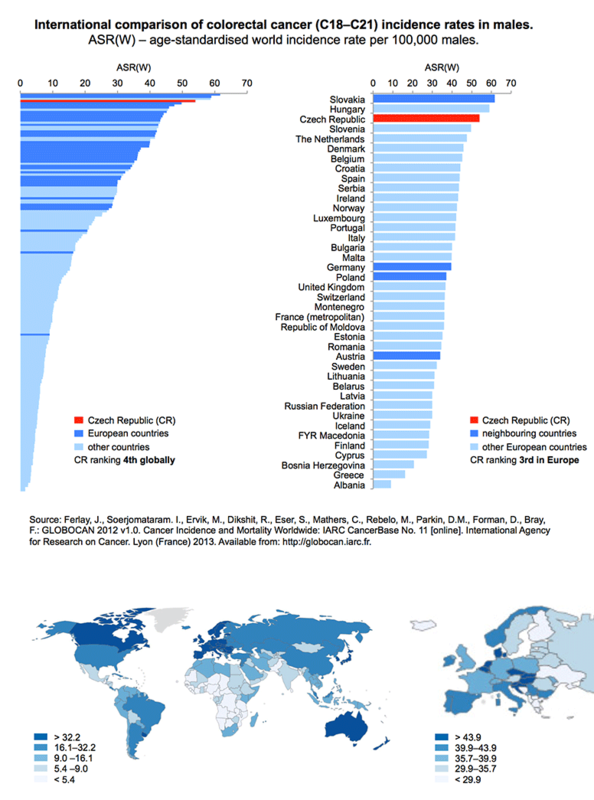 Czech male colorectal cancer incidence rates rank 4th worldwide and 3rd in Europe, while female rates rank 16th worldwide and 10th in Europe. From the global perspective, colorectal cancer incidence and mortality rates have continuously been highest in Central and West European countries. 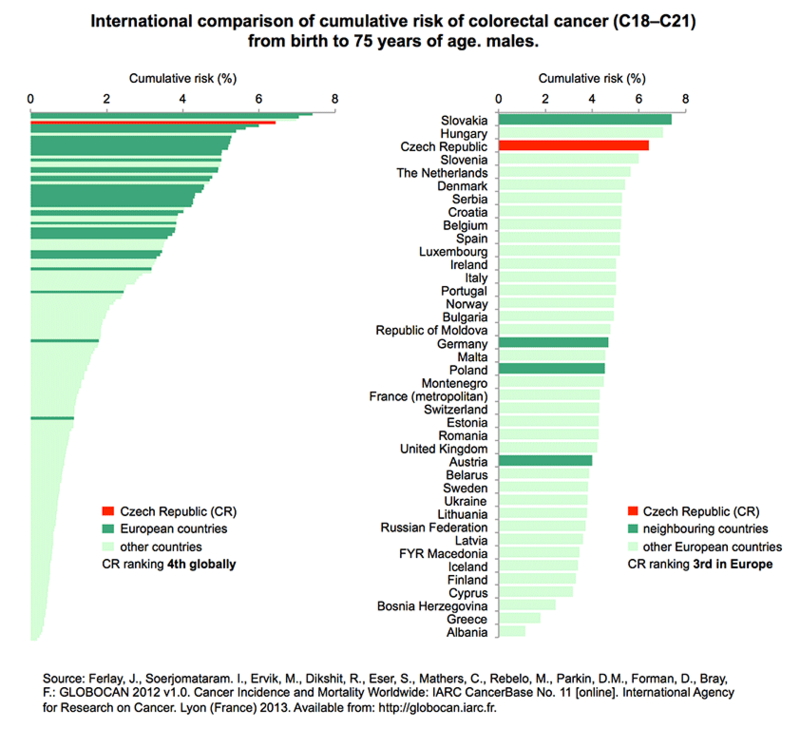 Among European countries in 2012, Slovakia, Hungary, Denmark, the Netherlands and the Czech Republic had the highest incidence rate of colorectal cancer. 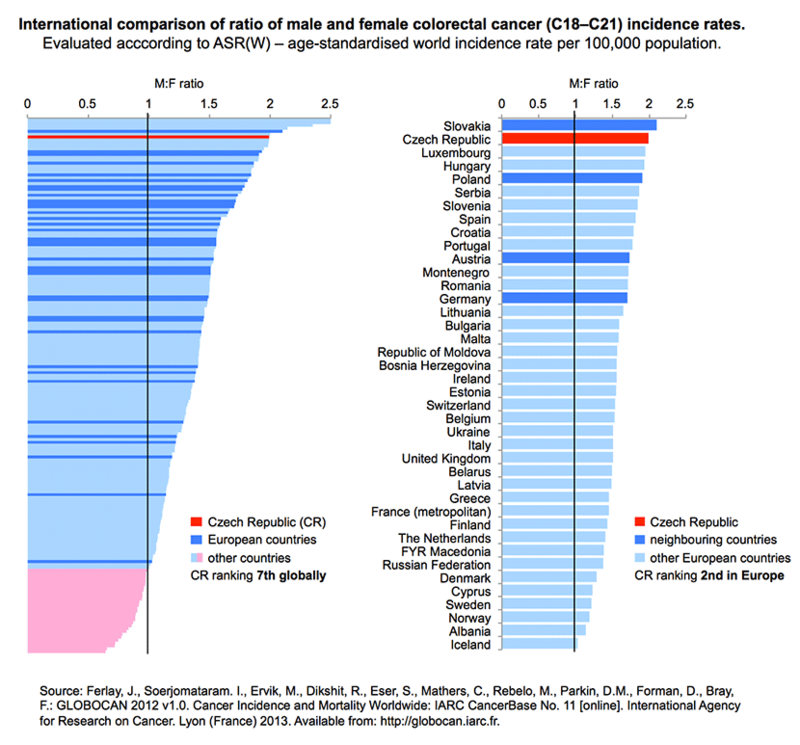 Figure 1: International comparison of colorectal cancer incidence rates. 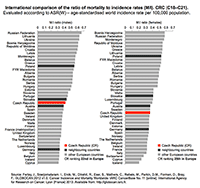 ASR(W) – age-standardized world incidence rate per 100,000 population. Left to right: persons, males, females. 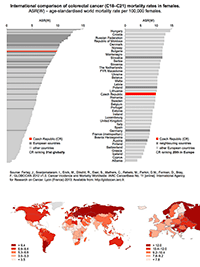 Figure 2: International comparison of colorectal cancer mortality rates. ASR(W) – age-standardized world mortality rate per 100,000 population. Left to right: persons, males, females. 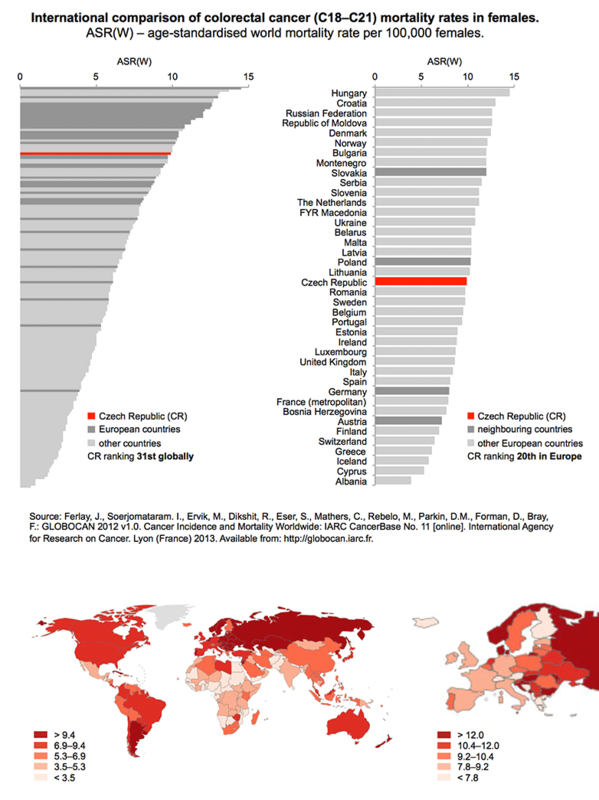 International epidemiological statistics make it possible to estimate the ratio of mortality to incidence rates (M/I), which can be considered as an indirect indicator of survival of colorectal cancer patients in a given country (Figure 3). 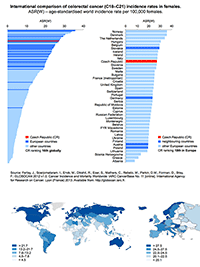 According to the most recent statistics, the Czech Republic with its M/I ratio at 0.40 slowly approaches the developed Western European countries, for which the M/I ratio ranges from 0.31 to 0.38. 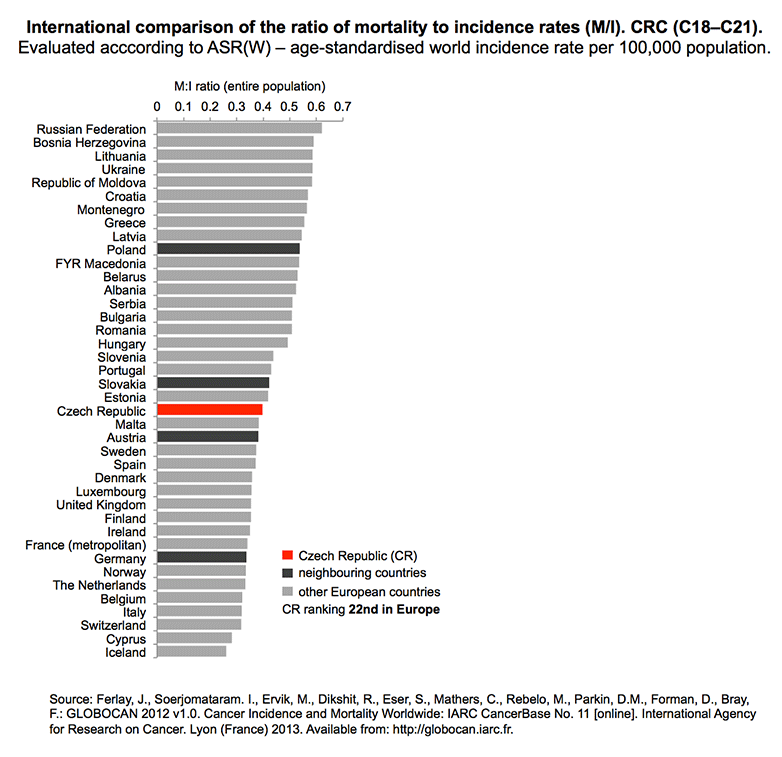 Recent data from the Czech National Cancer Registry  correspond to a M/I ratio close to 0.4: the incidence of 38.36 and the mortality of 16.46 (data from 2011 recalculated as ASR-W) give the ratio of 0.43. Internationally assessed prevalence rates (i.e., number of patients patients still alive five years after diagnosis) are shown in Figure 4. As a logical consequence, the highest prevalence rates have been reported for countries with the lowest values of M/I ratio. 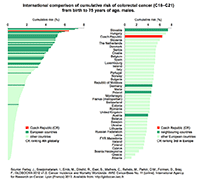 As for colorectal cancer prevalence rates, the Czech Republic is slightly above-average among European countries. 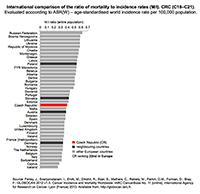 Figure 3: International comparison of the ratio of mortality to incidence rates (M/I). Evaluation was done using the ASR(W) – age-standardized world incidence rate per 100,000 population. 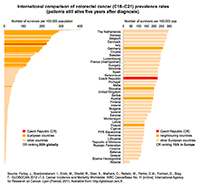 Figure 4: International comparison of prevalence rates (patients still alive five years after diagnosis). 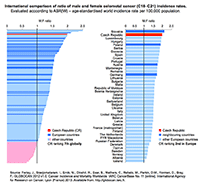 Figure 5: International comparison of ratio of male and female colorectal cancer incidence rates. Evaluation was done using the ASR(W) – age-standardized world incidence rate per 100,000 population. International statistics have also confirmed that men have higher colorectal cancer incidence rates than women. 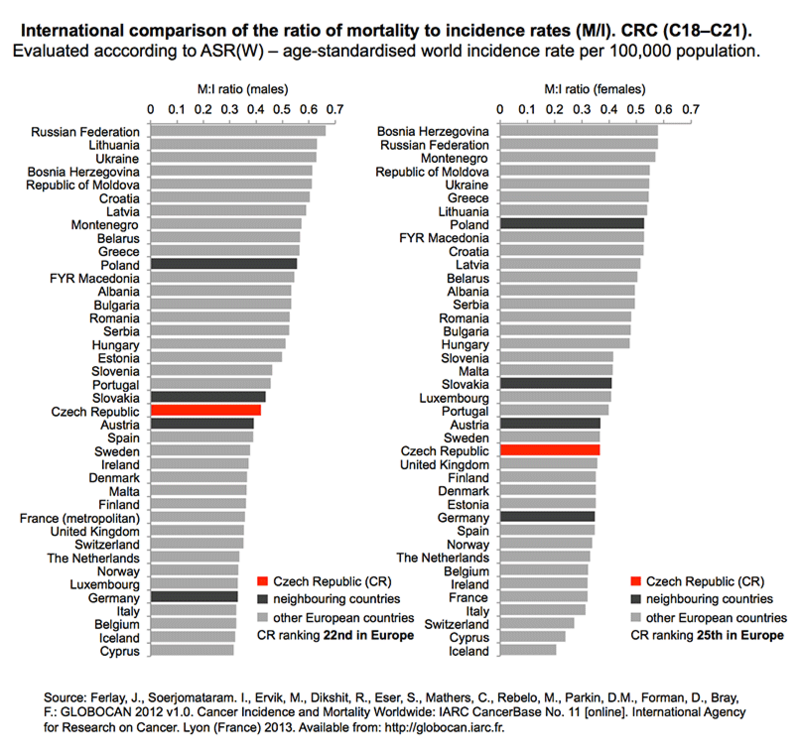 CRC incidence rates for the Czech population are almost eccentric in this respect. Overall the male:female ratio in the Czech population is 1.99, which ranks 2nd in Europe after Slovakia (2.10) (Figure 5). High values of this index are typical for Central European populations, while Nordic countries have reported lower ratios (typically less than 1.35). 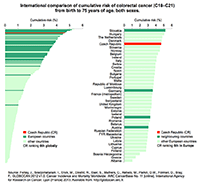 Let us conclude this overview of international statistics with a summary of cumulative risk of colorectal cancer from birth until the age of 75 (Figure 6). High values of this risk reflect a high population burden with this disease, which is typical for European countries in particular. 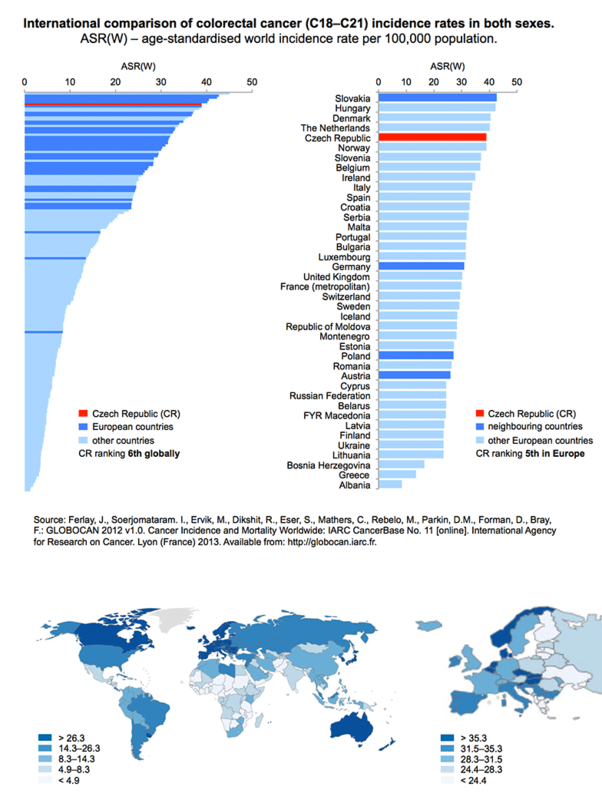 Cumulative risk for the Czech Republic is 4.64, so the Czech population again occupies undesirable leading positions in Europe (5th) and globally (6th). 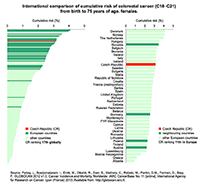 Figure 6: International comparison of cumulative risk of colorectal cancer from birth to 75 years of age. Left to right: persons, males, females. Ferlay, J., Soerjomataram, I., Ervik, M., Dikshit, R., Eser, S., Mathers, C., Rebelo, M., Parkin, D.M., Forman, D., Bray, F.: GLOBOCAN 2012 v1.0, Cancer Incidence and Mortality Worldwide: IARC CancerBase No. 11 [online]. International Agency for Research on Cancer, Lyon (France) 2013. Available from WWW: http://globocan.iarc.fr. Dušek L., Mužík J., Kubásek M., Koptíková J., Žaloudík J., Vyzula R. Epidemiology of malignant tumours in the Czech Republic [online]. Masaryk University, Brno (Czech Republic) 2005. Available from WWW: http://www.svod.cz. ISSN 1802 – 8861. Brenner, H., Hoffmeister, M., Brenner, G., et al. Expected reduction of colorectal cancer incidence within 8 years after introduction of the German screening colonoscopy programme: estimates based on 1,875,708 screening colonoscopies. 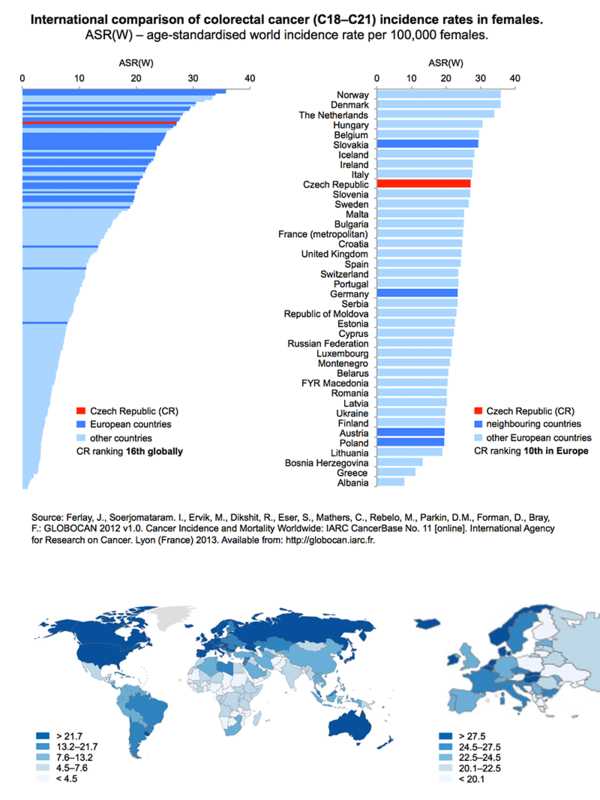 European Journal of Cancer 2009, 45: 2027-2033.